The supposed list of changes in the Xbox 360 Spring 2008 Update posted by Kotaku turned out to be a fake after all. In an exclusive interview with general manager of Xbox Live Marc Whitten, Next-Gen revealed that there will be no dash update this spring. That means no gamer picture as display picture, no Windows Live Mail integration, no Winks and no Xbox Live Vision support for Xbox Messenger... (yet). >> Read the entire Q&A at Next-Gen. It's a plausible assumption that patients recover more quickly or at least feel better when surrounded by friends and family. I briefly mentioned Talkonaut last month and its developer just informed me that the Windows Mobile 5/6 version of the client got released last week. Talkonaut is a mobile chat application that allows you to make and receive VoIP calls over GPRS, EDGE, 3G or WiFi. Calls to and from Windows Live Messenger, Google Talk, Yahoo! Messenger, AIM, ICQ and SIP phones are free (minus your mobile data transfer costs), while those to mobile or landline phones are rather cheap. - Microsoft's latest Messenger client for Windows Mobile 6 lets you send short Voice clips only. Talkonaut allows unlimited chatter. - Not even Microsoft's desktop client allows voice calls across IM networks. Talkonaut shows what interoperability really means. Talkonaut 4.0WM runs on all Windows Mobile-based PocketPCs and Smarthpones, including but not limited to HTC, iPAQ, Acer, Asus, BenQ, ETEN, LG, Samsung, etc. >> Download the Talkonaut 4.0WM CAB-file and install the app through your desktop. >> Download Talkonaut 4.0WM for Symbian S60 2nd and 3rd edition Nokias, J2ME-enabled phones or the Helio here. "Advertisers can now extend their campaigns to social media through Windows Live for mobile in France, Spain, the U.K. and the U.S. by creating banner ads that will be visible across Windows Live Messenger and Windows Live Hotmail. This builds upon Microsoft’s initial launch of mobile advertising for MSN Mobile in, France, , Spain, the U.K. and the U.S. where mobile ads are available alongside premium MSN Mobile content. Advertising on Windows Live for mobile is already available in Spain, and later this month will be available in Germany, Italy and the Netherlands, further extending its availability for advertisers. All ads placed on these two popular services will adhere to Mobile Marketing Association (MMA) guidelines." "We think mobile is a tremendous opportunity going forward (...) Only about 150 million of the 1 billion phones expected to be sold this year will have the capability to display rich advertising. But that number is expected to triple, so that in a few years 400 million to 500 million phones able to receive audio and video advertising will be sold each year"
I'll leave it up to you to decide whether this is good or bad news, but we had it coming anyway. UPDATE: Windows Live for mobile is now available in 49 different markets. The new ones are Argentina, Austria, Bulgaria, Chile, Croatia, Finland, Greece, Hong Kong, Hungary, Indonesia (English only), Ireland, Latin America (rest of region), Malaysia, New Zealand, Philippines, Poland, Portugal, Romania, Serbia, Singapore, Slovakia, Slovenia, South Africa, Switzerland, Thailand (English only), Turkey and Ukraine. Previously it was already available in Australia, Belgium, Brazil, Canada, China, Czech Republic, Denmark, France, Germany, India, Italy, Japan, Korea, Mexico, Netherlands, Norway, Russia, Spain, Sweden, Taiwan, United Kingdom and the United States. Media Week has obtained exclusive data from Nielsen Online, which indicates that people are spending less time on instant messaging services due to the growing popularity of social networks. Whereas a typical IM user actively spent 3 hours and 32 minutes on the service in March 2007, the average time in March 2008 had decreased by 19 per cent to 2 hours and 51 minutes. Simultaneously, time spent on social networking sites such as Facebook, YouTube and Wikipedia has grown significantly. YouTube users for instance now spend an average of 58 minutes watching videos, a 21 per cent increase compared to last year's time. On a brighter side, the number of unique IM users hasn't diminished during the same period and instead grew by 3 per cent. However, the social network userbase has increased by 12 per cent over twelve months. Nielsen Online analyst Alex Burmaster commented: "Instant messaging has traditionally had the most total time spent, with one in every nine minutes of UK internet time spent on instant messaging sites*. But over the past year, while its audience has grown slightly, their reach has not kept up with the number of people logging on to the internet." With people spending an average of 14 minutes (or 33 per cent!) less using AIM, AOL was worst hit by the growing preference for communication via social networks. I wasn't able to find any specific data for Windows Live Messenger but the general numbers are alarming nevertheless, and I do hope Microsoft is getting prepared to push their Messenger into the social networking space a lot more in the near future**. Not just for them, but for Mess.be as well. >> *See also: Windows Live Messenger most engaging app in UK. >> **See also: Will Facebook Chat kick Windows Live Messenger in the teeth?. MSN Messenger 7 introduced the option to show Messenger contacts through a live-updated personal status message what we're watching/listening to in Windows Media Player and even iTunes (or Winamp, if you apply Mess Patch). The realization finally dawned upon Microsoft that the feature should support Zune as well, and since the Spring update earlier this month, the status message can also display the song currenty being played in the free Zune software. 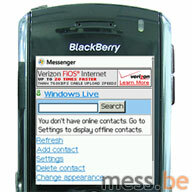 "Windows Live Messenger contacts will now be able to see what users are listening to via the Zune software. Clicking on the tracks displayed in the “Now Playing” feature will connect the Windows Live Messenger friend directly to that artist’s page on the Zune Social"
To activate, click the tiny downwards arrow next to your PSM and enable the "Show what I'm listening to" option. "According to a circular from the Chinese State Council, all public amusement would be suspended during that period, and Chinese embassies and consulates around the world placed condolence books for comments. The Olympics torch relay would also be suspended for three days (...) The Chinese stock markets also suspended trading for three-minutes in response to the mourning." The online world took part in the commemoration too. Since Sunday, instant messages had been circulating to call for all IM users to put their presence to Appear offline or Invisible at exactly 2:28 PM, so that their status icon would turn grey as a sign of mourning. Major Chinese search engines and portals, including Google China, changed their color palettes to greyscale as a sign of mourning. To follow up on our earlier story, over 2.7 million Chinese Messenger users have already put the rainbow emoticon in front of their nicknames to support the construction of the Rainbow Elementary School. Going strong! What?! Still haven't finished Grand Theft Auto IV? Man, close your drapes, turn off your mobile, and start playing! Or wait, don't forget to use one of our fifty GTA IV Display Pictures to show your Messenger contacts you're in the midst of this best selling (and maybe even best ever) game and don't want to be disturbed. Microsoft also released a GTA IV Theme Pack for Windows Live Messenger containing 4 display pictures, 1 conversation windows background and 6 static emoticons. >> Browse our 50 Grand Theft Auto IV (GTAIV) Display Pics. >> Grab the Grand Theft Auto IV Theme Pack here (Internet Explorer only). PS: I don't even own the game. I was just told it ruled. MSN China together with Toyota are converting Messenger users' sympathy rainbow signature into actual donations. Similar to the i'm Initiative in the States, MSN is counting how many unique Messenger users in mainland China have the (r) keyboard shortcut in their nicknames. Per supporting user, they donate 0.10 Yuan (~US$0.015 or €0.009) to disaster relief which is then doubled by partner Toyota. According to the last count, 1,302,476 people in China are already supporting the campaign through Messenger, which multiplied by 0.20 amounts to 260,495.20 Yuan (~US$37,348 or €23,909). Donations will go to the construction of the Rainbow Elementary School which aims to allow children from the disaster area to return campus as soon as possible. More partners are welcome to join the campaign. They can contact 2008SCrainbow@hotmail.com. UPDATE: 2,100,682 Chinese users have already put the rainbow emoticon in their nicknames, good for RMB 420,136 (US$ 60,269 or €38,818). In other news, Chinese Microsoft employees have already raised more than 1.2 million Yuan in individual donations. Matched on a dollar for dollar basis by the company, a total sum of 2.4 million Yuan (~US$344,080) has already been sent to Red Cross China.